Hi Everyone! We welcome you back to another product introduction! But this time, instead of a stamp intro, we are highlighting one of the bigger creative cuts that we will be carrying! This Gable box measures approximately 6" x 5-1/2" flat and 3" x 4" x 2-1/8" assembled. We love this box because we can do so much with it! It's great for party favors, small gifts and it even fits gift cards! Please note, due to the size, this will only be available at the mamaelephant.com shop! 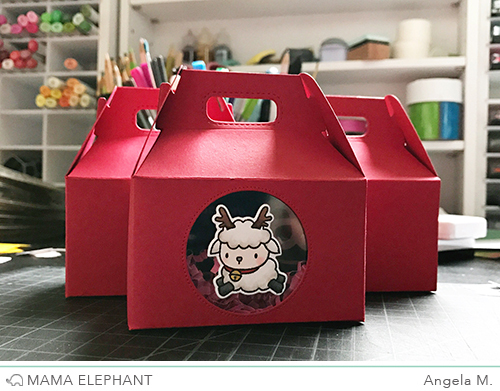 For this post, I created the gable box with a small window by using a 1-1/2" circle die cut (the circle die I used not included in this set) and decorated it with a sweet lamb from Wooly Winter. With this box design, peeking is allowed! I also made my very first amateur tutorial video, Speedy Gonzales style! It was taken on my iphone camera in the time lapse mode. Since I'm still experimenting, please pardon my novice video skills! VERY excited about this cute lil box! Love all the dies that come with it! Adorable! Perfect packaging for giving holiday goodies! Will this die fit through a cuttle bug? This is just perfect for treats.An Excellent make. 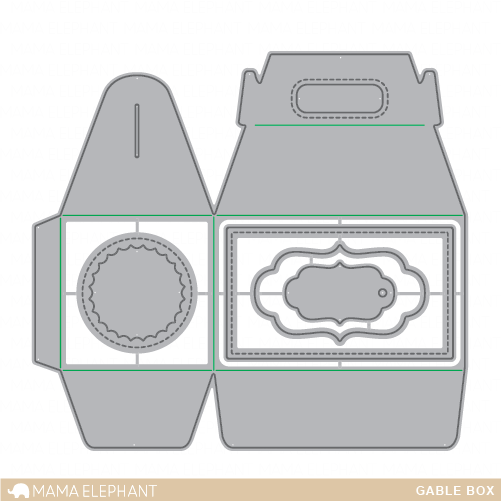 Really fun Gable Box, and perfect for the holidays...Love it! Love, love, love it, can't wait! Video was great it's adorable but it was a little to fast, lol. Great for teachers gifts, just the right size. Thanks for sharing and inspiring. I adore this box...thanks for the video!!! Absolutely ADORE this box!!! It's so fun and cute. Love this style of box, awesome new die!! Does this fit in a cuttlebug?? I hope so. Im totally hooked on these products! So adorable!! Loving this release. Your designs are so cute. I would love to win (as I'm sure everyone else would)! I am a big Mama Elephant fan. I love everything. Love Hess stamps would love to win a set! Love the stamps, would love to win a set. Congrats on 4 years!! Love Merry Christmas Wishes & also Birch Trees! On my list. �� Thx! Love mama elephant. So much fun stuff. Would love to play with them all. Congratulations on 4 years!!!! Love pix's happy holiday and Merry Christmas! !!! Congrats!! I love all the sets!! Don't know that I could even pick a favorite. The pixies are adorable. Thank you! !